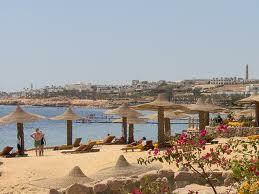 The simplicity of sun, sea and sand, the luxury of five-star hotels, shopping and entertainment, this is Sharm el-Sheikh. In fact, with diving and snorkeling, windsurfing and other water sports, horses and camel riding, desert safaris, and great nearby antiquities attractions, it is almost impossible for a visitor to ever suffer from boredom. Located on the picturesque Sinai Peninsula, the Egyptian resort of Sharm El Sheikh is regarded as one of the best diving destinations in the Red Sea. With a climate which is mainly hot and dry all year round, Sharm El Sheikh attracts visitors in search of sandy beaches, guaranteed sunshine and a great choice of water sports. There is a great choice of flights to Sharm El Sheikh, Egypt including direct flights to Sharm El Sheikh on scheduled airlines EgyptAir and Monarch and low cost flights to Sharm El Sheikh, Egypt with easyJet. There’s also a choice of charter airlines. If you’re a keen diver or fan of water sports, Sharm El Sheikh is the perfect base to explore the many superb diving sites off the Sinai Peninsula. With warm sea temperatures, calm waters and a great variety of marine life including rays, turtles, tropical fish and even the odd Hammerhead shark there are many dive sites to discover. The most popular sites include the Ras Mohammad National Park, The Gardens and the Yolanda Reef home to a shipwreck of the same name. As well as diving, there are a host of other water sports available such as snorkelling, wind surfing and kayaking. If you’re after a good sandy beach to relax and sunbathe on, one of the most beautiful in the area is Na’ama Bay boasting picturesque views and inviting warm seas. If you can tear yourself away from Sharm El Sheikh’s glorious coast, there are several interesting visitor attractions close by including Mount Sinai where it is believed Moses received the Ten Commandments. It’s possible to climb Mount Sinai as there are steps and a choice of paths up to the top. Also worth a visit is St Catherine’s Monastery which is believed to be the oldest Christian monastery still in use in the world. St Catherine is home to some of the oldest religious icons in existence and the Chapel of the Burning Bush which is believed to have been built where Moses saw the burning bush in biblical times. Also popular from Sharm el Sheikh are a variety of trips into the Sinai Desert where you can ride on a camel, quad bike, enjoy a Bedouin cultural show or indulge in a spot of star gazing. Our great flight comparison facility allows you to find the best prices on cheap flights to Sharm El Sheikh, Egypt. We recommend you book well in advance for the cheapest flights to Sharm El Sheikh, Egypt, however there are superb offers being released throughout the year so if you’re looking for lastminute flights to Sharm El Sheikh, Egypt, check out our latest offers. The Sinai area of Egypt is a very arid desert climate with 2 main seasons, both of which are dry seasons. The winter months are between November to March. In this time the day temperature is still warm but the night time temperature can drop to about 12°C and inland in the desert it can get less than this. The annual rain fall is zero. In the winter months it can rain for a few seconds and every few years a storm can come through where it absolutely chucks it down. The summer weather is very hot and dry. The temperature in the day can be in the forties and night time the temperature is still in the mid thirties.